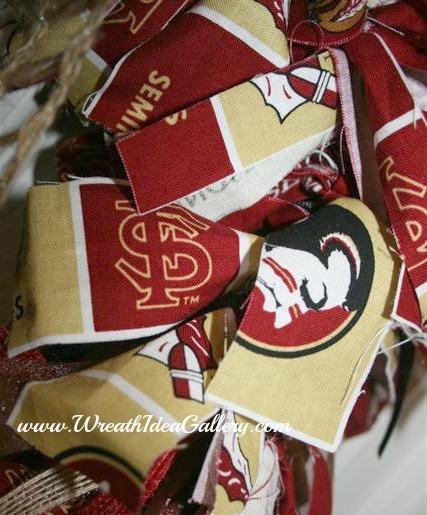 This FSU Rag Wreath is Fun and easy. Your favorite team printed material, or team colors. Your favorite team's colors, if you look around you can find material with your team's logo on it like I was able to do. I also added some ribbon for different texture. And for some sparkle I also used a brown chiffon material with little sparkles on it. 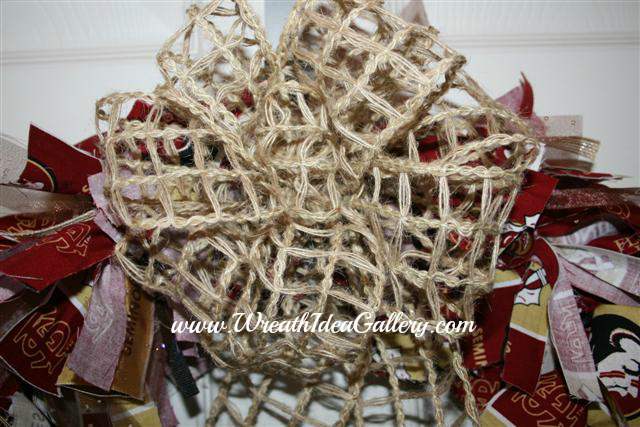 Cut fabric and ribbon into strips one inch wide by eight inches long. 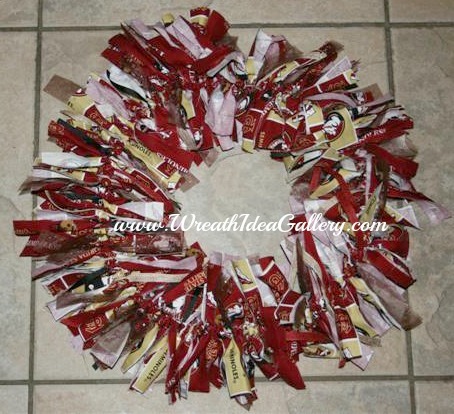 These do not need to be precise, you will never know when they are on the wreath. 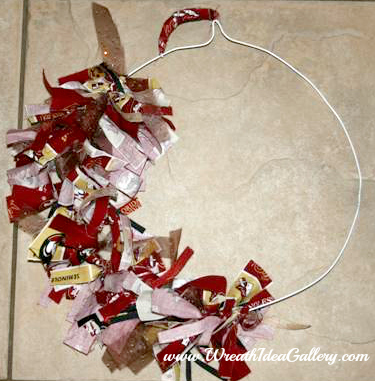 It is football season I would like to share your TEAM SPIRIT Wreath here in the wreath idea gallery for others to see. Start with a standard wire hanger, and bent the hook over and with wire plyers and made a hanging hook. 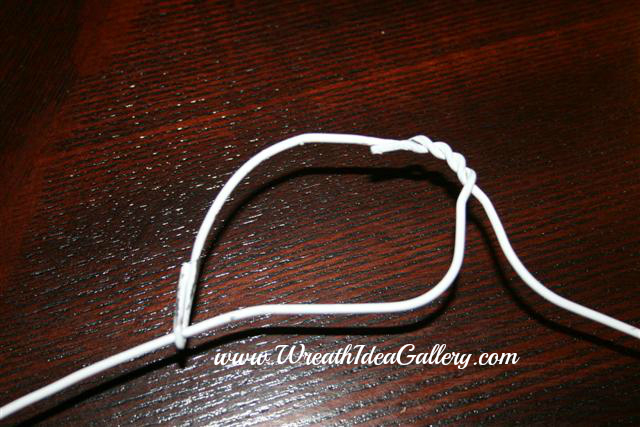 Take a longer piece of one inch wide material and hot glued the end and wrapped it around the hook and secured the end with hot glue, so there were no sharp ends of the wire hanger to catch on anything. 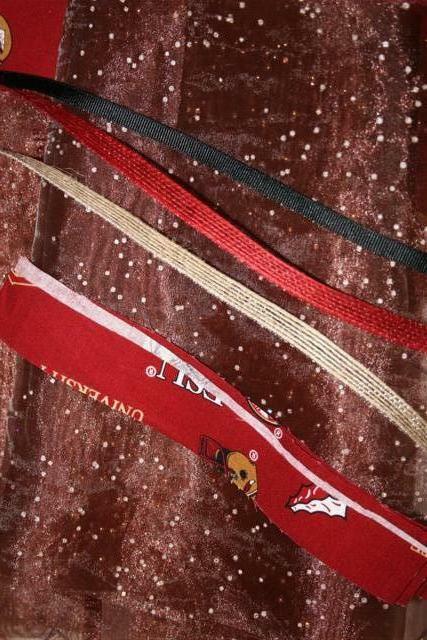 Start tying on the fabric strips, alternating your different materials and ribbons. Push them close together and keep them tight so there is no wire showing. I randomly tied my ribbons on, I did not follow any specific pattern. I made a bow with my ez-bow maker, and tied it onto the wreath. This is an easy project for you people learning to tie. Made this with preschoolers 4-5 year olds, gives them good practice with the first step in the shoe tying step and also develops the muscles in their fingers which helps with future writing skills. I may earn a commission by referring you to some products on my site. See my Disclosure Policy. 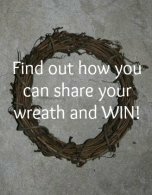 I promise to use it only to send you Wreath Idea Gallery News. 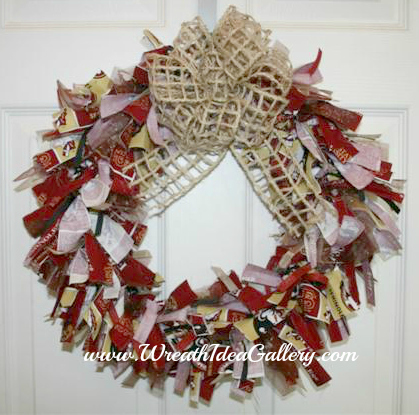 Copyright 2012-2014 WreathIdeaGallery.com All rights reserved. Content and photos may not be reproduced in any way without permission.